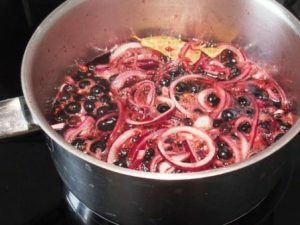 Cut the red onion into thin rings, pour blackcurrants, blackcurrant juice, onion rings, peppercorns, vinegar, sugar, and bay leaves into a small pot. Let it simmer for 5-10 minutes and remove from the stove. Let it cool. 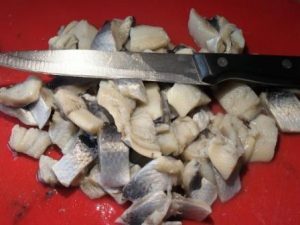 Cut the herring into bite-sized pieces after draining and rinsing them and fold them into the blackcurrant mixture. Let sit in the fridge for 1-2 days, covered, before serving them. Remember, the longer the herring gets to sit in the sauce, the more tender they’ll become. This recipe has been found on here.